By car or by plane? 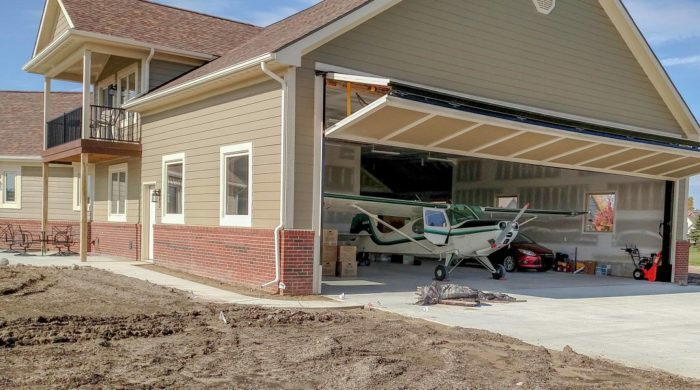 Reid Baldwin's house, built at an airpark in Michigan, includes hangar space for his 1948 airplane. 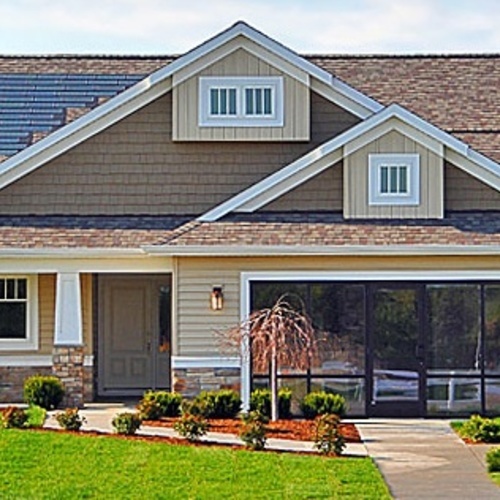 This essential design element is actually required by the homeowners' association. Image Credit: Reid Baldwin From the street, the house has a conventional appearance. The garage can accommodate an airplane, cars and an RV (represented by the rectangular shape just to the right of the airplane's wing). Image Credit: Reid Baldwin A bedroom and bathroom on the first floor can be guest quarters for now, but ultimately could become the master suite. The master suite on the second floor includes a large bathroom and generous closet space. Editor’s note: This is the first in a series of guest blogs by Reid Baldwin about the construction of his house in Linden, Michigan. For many years, I have dreamed of living at a general aviation airport. Instead of driving to the airport to go flying, I would just step out the back door. When I am done for the day, I would sit on the back porch and watch takeoffs and landings. Well, it now seems to be happening. Our old house has been sold and we have moved to an apartment. We purchased a lot on the airport in Linden, Michigan. The new house has been designed. Now, it is time to build it. For people who know me well, the reasons for wanting to live on an airport don’t require much explaining. Sometimes I forget that, for most people, it is a fairly radical idea. When most people think about an airport, they envision the airline terminals that they slog through in the course of traveling between distant cities. That is not the type of airport I chose to live at. I am a recreational pilot. I fly an airplane that was built in 1948. The way I use my airplane is comparable to the way recreational boaters use their pontoon boats or ski boats. I enjoy flying around the area when the weather is good. I enjoy taking friends and family for rides. My desire to live on an airport is analogous to the desire of recreational boaters to live on a lake. The neighborhood we built in is a called an airpark. Most of the lots have direct taxiway access. All of the houses on those lots have attached hangars. (The home owners association actually requires it.) There are dozens of airparks like this around the country. We were fortunate enough to acquire a lot that has a good view of the runway and excellent southern exposure for solar, as long as we designed the house to take advantage of it. I am often asked why I decided to design our house myself as opposed to using an available design. The reason I usually give is that there are very few available house plans with attached hangars and adding a hangar to a conventional plan doesn’t work very well. An attached hangar tends to preclude an outside view from a relatively large fraction of the perimeter of the house. 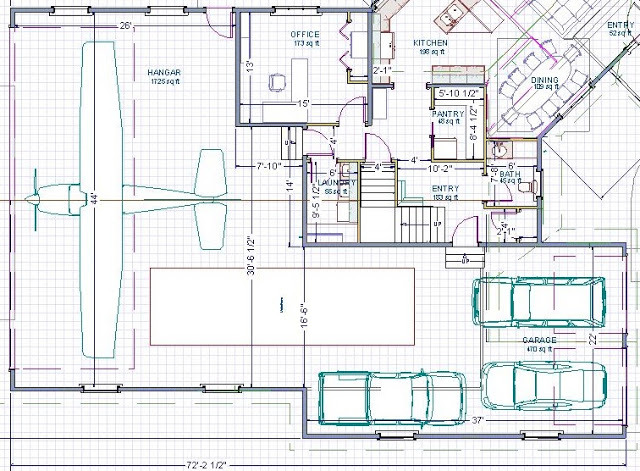 Although there are a handful of rooms for which a view to the outside is not important, conventional house plans usually do not locate these rooms in the location at which a hangar would make sense. We were not likely to find any off-the-shelf house plans that worked. When I am being completely honest, I admit the main reason I designed the house myself, as opposed to hiring an architect, is my personality. I have always enjoyed designing things. For most of my professional life, I designed automotive transmissions. In my 40s, I decided to change directions and become a patent attorney. 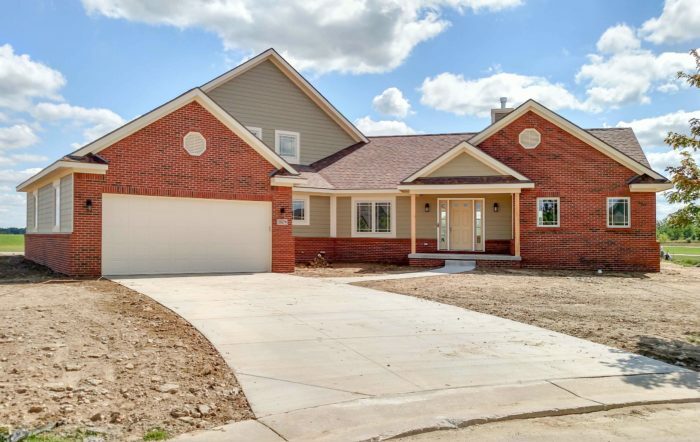 I enjoy learning about new fields, like the science and practice of homebuilding. I enjoy the challenge of manipulating the parts to try to achieve what we want. I am looking forward to seeing something I designed become a real-world structure. My education about building science wasn’t very structured. As I played with potential floor plan ideas, various questions came up. “Would that be really expensive to build?” “Can walls come together like that?” “Can I put the second floor bathroom over the garage?” Searching online, I usually came across the answers to 20 questions I hadn’t thought to ask before I found the answer I was looking for. I discovered the wealth of information at sites like Green Building Advisor, Building Science Corporation, and HeatSpring. I was surprised at the gap between the best known way to build houses and the way it was typically done. Of course, I didn’t know enough to specify everything that needs to be specified. I was fortunate to have a builder who was open to departing from his usual practices and who provided the kinds of knowledge one cannot get from web sites. 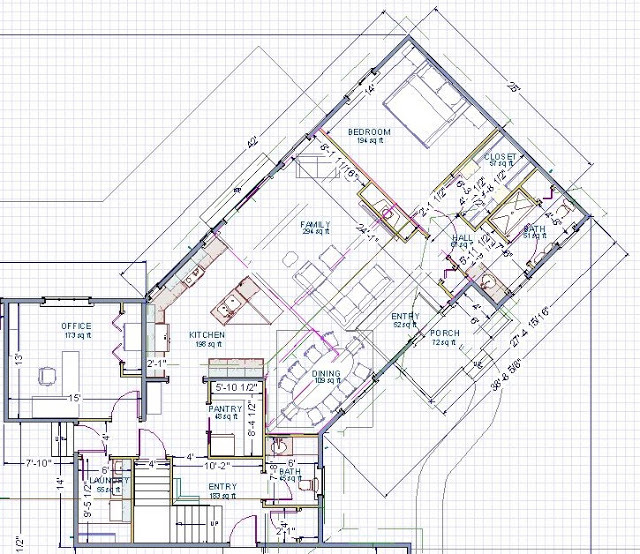 A couple years ago, I purchased Home Designer software and started designing floor plans. Hundreds of versions later, we have a design that we are excited about. 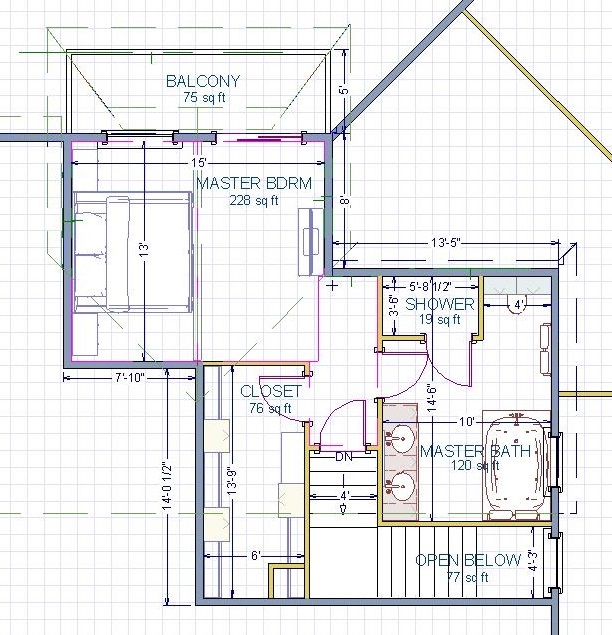 Some of the things we want in our house plan will be familiar to most people designing a new house while other needs are specific to our situation. My wife and I intend to live in this house until the kids send us off to assisted living. Those kids are college age now. They will probably live in the house off and on for the next few years. How do we design a house to be suitable for just the two of us and also suitable for a holiday gathering with our kids, their eventual families, our parents, and our siblings? For the main floor, we want a kitchen open to the family room. When we have a family gathering, we don’t want the cooks to be segregated from everyone else. If age or disability eventually prevents one of us from being able to climb stairs, we want to be able to live on just the first floor. So, we put a bedroom, office, and laundry room on the first floor. Although we label the bedroom as a guest bedroom, we provided a closet and bathroom that would make it a suitable master suite. The master suite is upstairs. We wanted to make sure to address the things we didn’t like about our old master suite. Although our previous bedroom had a walk-in closet, it was really too narrow to have clothes hanging along both sides. The new house needed a bigger closet. As the design evolved, sometimes the closet would get even bigger because there was some unused space adjacent to it. If the design evolved in the opposite direction, Julie would protest. It seems you can never make a closet smaller. Our old master bathroom was also just a bit too narrow. Like the closet, the master bathroom seemed to grow as the design evolved. Anyone with aspirations of designing a modest home should avoid watching HGTV (except maybe the show about tiny houses). The hangar and garage presented some unique challenges. Obviously, we need a door on the taxiway side large enough for the airplane and doors on the street side for the cars. We also want to store our motorhome in the hangar. Even existing house designs that have hangars rarely have provisions for RV storage. The motorhome (the rectangle in the image showing the hangar) dictated the height of the hangar. We decided that it was easier to increase the height of the hangar door to get the motorhome in and out than to have a tall enough garage door. The hardest part of designing the house was not making individual regions work out, but making them work together. The roof sections need to come together in a way that is buildable and aesthetically pleasing. Sometimes, the logical places for windows from the interior didn’t look good from the exterior. 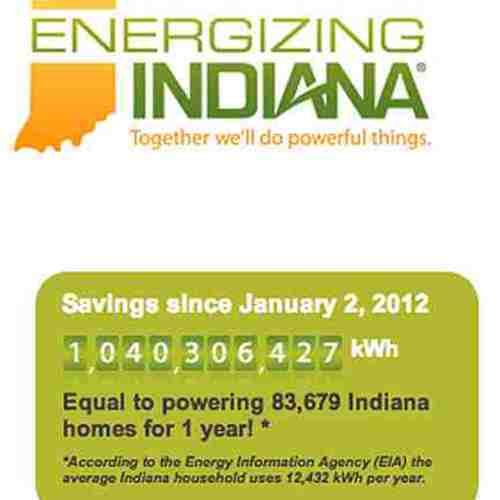 No design is without compromises, but after many, many iterations, we have a design that we are pleased with. We have good views of the runway from the rooms that we will spend the most time in. We have a large south-facing section of roof that is suitable for solar panels. I doubt if we have thought of everything, but hopefully we have thought of all the important things.